I'm about to get super excited. Yeah, just about. Why? Because FALL is officially here in the U.S. Now, where I live, you certainly can't tell by the temperature but it says so on my calendar and on the news, so I'm going with that. On my jog this morning, because of the temperature combined with the humidity level, I was sweat-ing. I can't wait to have that temperature where I need to wear a jacket on my jog, or at least leggings. And now that I'm thinking about it, we actually had a week of that about a month ago. Ahhh. 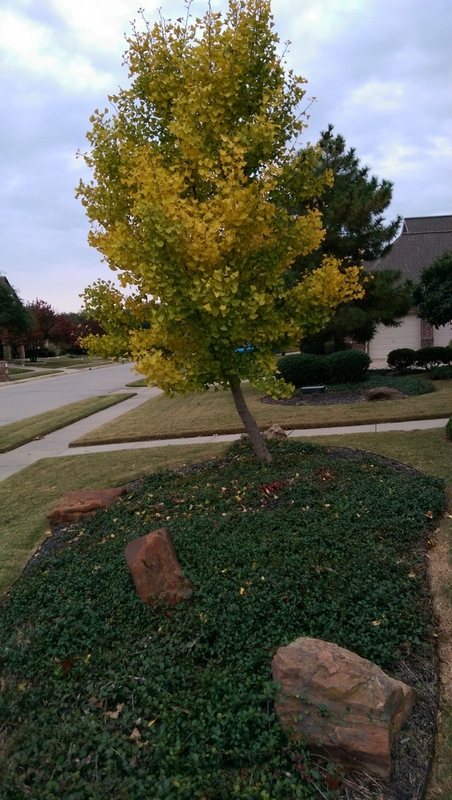 My ginkgo tree turned about half yellow overnight. It's crazy! Yes, the change, it is a comin'! Are you ready? Change is inevitable. If everything remained the same, how boring would that be? No change, no growth. No growth, no change. Bore-ing. One of the best things we can change is our minds. But when you hear those words, "change your mind," or "have you changed your mind," how does it make you feel? What are your thoughts? Negative...positive? The negative side of changing your mind. Some people feel that if they change their mind, they will be viewed as "wishy-washy" or flakey, or even indecisive. But why? Is it what they really feel about themselves, OR is it what they perceive is felt by others about them? Most importantly...is either one true? Aside from those negative feelings and perceptions, changing your mind can be negative if...the purpose behind it is negative or potentially negative. An example would be, say, if you're about to head out for your morning walk. Well, maybe the alarm just went off for you to head out for your morning walk. And when it does, you hit the snooze button. And again. And again. And...then you just...change your mind and don't go. No reason. You just "don't feel like it." Now, this is potentially negative because it can actually begin a habit that, well, isn't necessarily positive. If this habit continues you'll eventually adopt a new habit of not taking a morning walk. Now as your coach, my question would be, "What will you commit to doing instead?" But that's another story. The positive side of changing your mind. And what about how you would feel, or how others would feel about your change? Think about it. You would feel good that you've taken control of your choices, and made a positive step in a better direction. Now, I'll be the first to tell you that others' perception of your positive change may not always be well, positive. I mean, their opinion, ego, outlook, etc may come into play. But don't let that stop you from changing your mind. Sometimes, even the cheese stands alone. Here's something new for ya! I've started my own radio show! Yep. I'll turn it into a podcast here soon. Actually, I'll have both. And if you'd like to listen to the 2-part episode I just did on Changing Your Mind, you can listen in HERE. Go to Apple Store or Google Play on your smartphone or from that page. Do a search for anchor. (Look for their little icon.) Download. It's safe! Open the app on your smartphone, and search for Deni Carruth. Select. You'll see that you can listen to any of my episodes at any time! You can "call in" at ANY time you are listening right from the replay page. No really. Just look there at the bottom. You can type in a comment. I'll get a notification. If it's cool, I'll publish it, and it will be heard on future replays. You can say your name or remain anonymous. I can then answer, comment, and that too will be added to any future replays! I want my ChatZ From the Bridge station and podcast to be a ready resource for you! Want some way-cool information and tools to use for you to achieve your weightloss goals? Click HERE to download a nice bundle of goodies. You're welcome. Always remember: Action steps are the beginning of new habits. New habits are the beginning of change. Change is the only thing that will get you from where you are now, to where you want to be. Yours Truly is a featured spotlight in the September (brand new!) 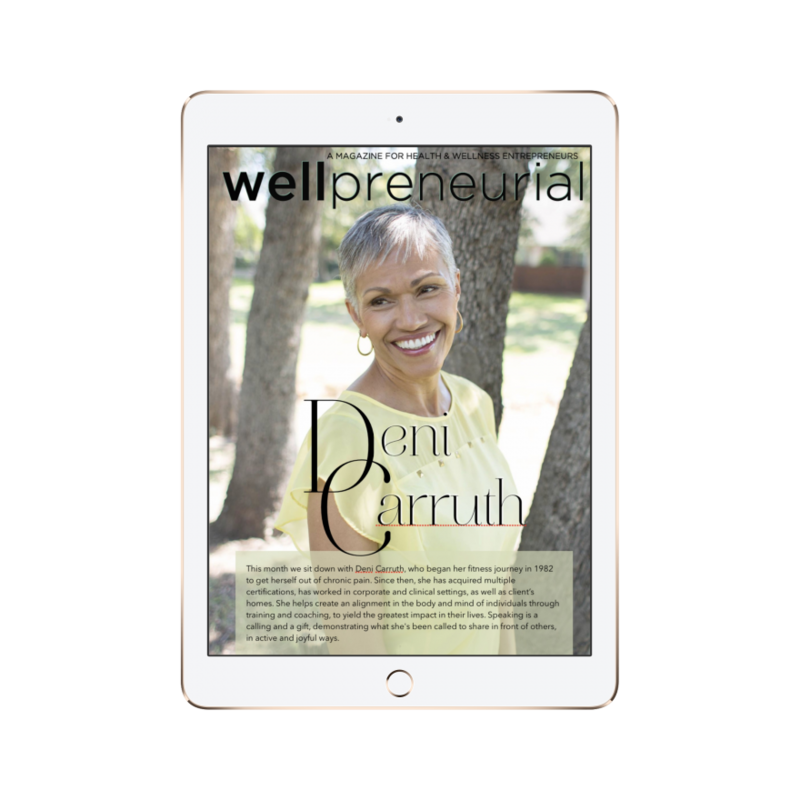 issue of Wellpreneurial Magazine, a new online magazine for wellness professionals. I just happened to have scheduled a photo shoot with the amazing Jamie Brogdon of http://www.jamiebrogdonphotography.com, that was just in time for the magazine spread! Too fun! I know! It's all personalized according to your intake information, and everything works together. It's all available online, so it doesn't matter where you live, where you work, or what time you need or have to do what it takes to get 'er done. You can just bring it up on your smart device. Don't worry about whether or not it's personalized "enough" for you. I'll make sure you get what you need. It all starts with inputting the proper information so your programs are created just for you. In addition to that, you'll have phone coaching sessions with me that you can schedule monthly, if you like. If you want more information, check out the first video HERE. If you've seen that one, and you want a more in-depth look, let me know that too. I am all about your lifestyle. Whether that's from a health perspective or for your lifestyle in general. We can tap into a better you faster together. If you're ready to change your mind about the way you approach your lifestyle, for life...I'm here for you!